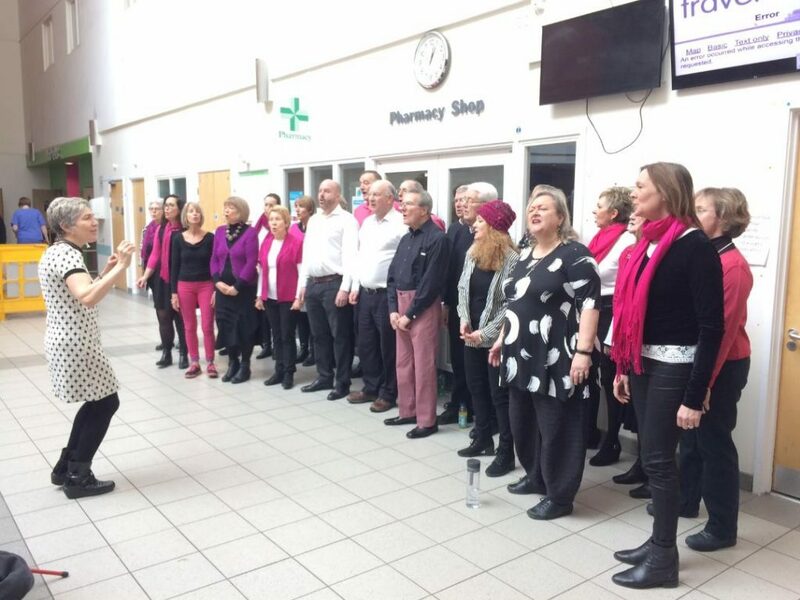 The RUH had requested a maximum of 25 singers at this gig and the worry of being heard above the bustle and noise of a busy hospital entrance hall could have been a challenge. Not for Sounding it Out! 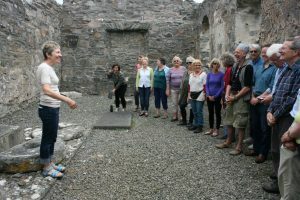 The choir sang out above the noise and were really well received by visitors and staff who stopped to listen to some of our regular songs and a couple of new ones such as the rousing Italian song Bella Ciao. Our annual festive concert was held, once again, in the magnificent setting of Edington Priory. The concert was well attended and the varied set list seemd to go down well with all. There were four interludes interspersed amongst the whole choir repertoire where small groups from the choir performed brilliantly, various festive songs of their choice. We made £582.62 forthe charity Papyrus, which aims to help prevent teenage suicide. What a great night! Such fun was had! 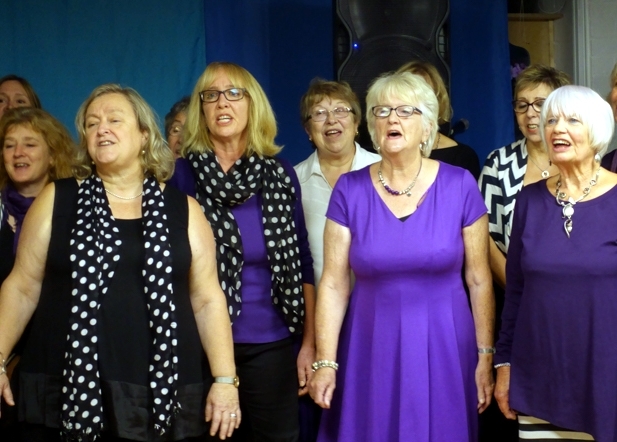 This fundraising concert took place in the newly opened Dementia Day Centre at the Old Silk Works in Warminster. and at the end of the night everyone was over the moon to find out that we had raised £840 for Alzheimer’s Support! We shared this event and the rather small stage area with the wonderful, Frome based ukulele orchestra, The Frukes. Sounding it Out took the stage for the first half, singing from their very diverse repertoire. This included many superb and often crunchy arrangements by Caroline of traditional English and Norwegian folk songs, gospel and African songs and pop songs, such as David Bowie’s Where are We Now and La Bamba. 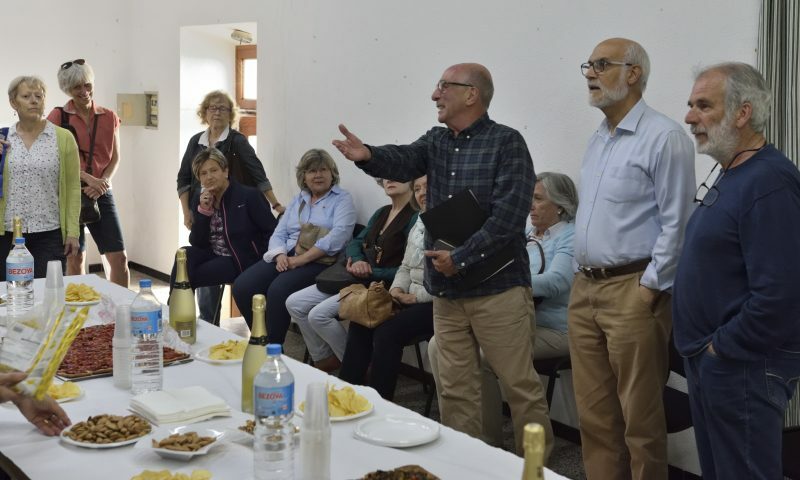 This was followed by a break for wine, delicious snacks and a raffle, (of course), before the Frukes were welcomed on to the stage to provide the entertainment for the second half. The infectious bounce of the orchestra got everyone smiling and joining in, as they sang, played and danced to, a range of well known pop songs from the eighties and nineties. The finale was a joint rendition of Jolene and Rudi/The Tide is High, with the audience joining in too! The All Saint’s Church provided excellent acoustics for our lunchtime concert and first time as part of the Westbury Festival. 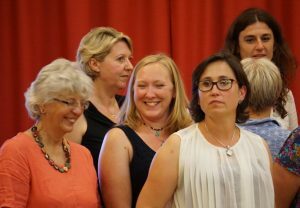 We were warmly welcomed by the organisers and sang our repertoire to a good sized audience. It was great to have a class of children from a nearby primary school in the audience too. They sat and listened attentively to our eclectic choice of songs and it was lovely to see their faces light up when we sang the theme tune from the film, Frozen, for the first time in public. The beautiful Peto gardens at Iford Manor were the setting for another sunny September afternoon afternoon of singing. 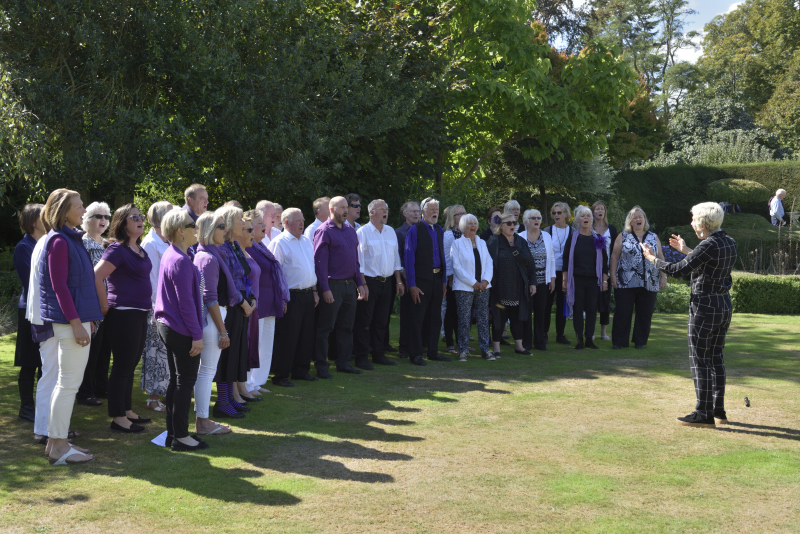 A sunny, early autumn day at the beautiful National Trust property, The Courts, in Holt, was the venue for our lunchtime concert for visitors to the gardens on this Heritage Open day. We sang a good mix of songs from our rep ertoire at various locations around the garden, finishing with a rousing applewassail in the orchard, in praise of the apple harvest. 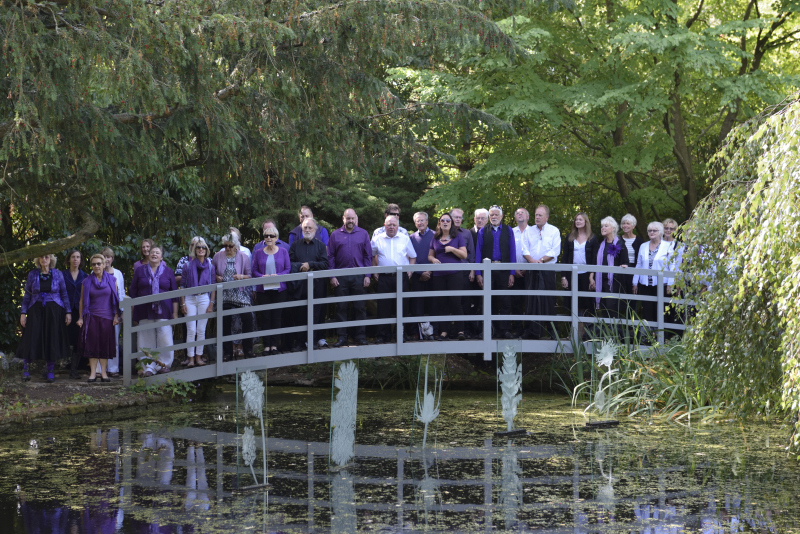 Once again a lovely evening of singing together, as one choir and also as individual choirs. It is good fun to all join together but a real treat to have the chance to listen to Caroline’s other choirs sing too. 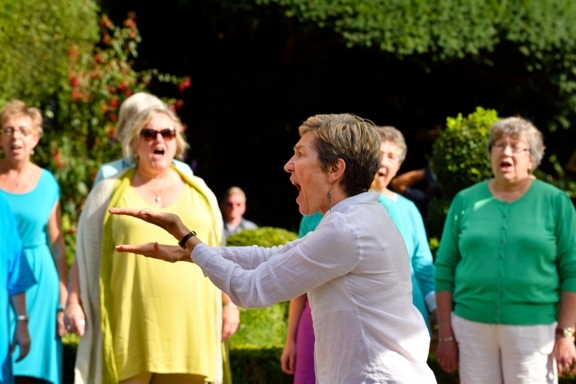 A very hot evening led to a choir member being taken ill and the whole choir and audience de-camping to the carpark to sing, returning inside to complete the event after the interval. Roll on September and the start of a new singing year! As always this was an excellent night out and one that we always enjoy being part of. Once again our venue was the United Reform Church and we sang a wide range of songs from disco classic, Boogie Nights, to the ever popular La Bamba, and a couple of gospel tunes through to gentle folk song, Love Call Me Home. As usual a drink in the pub around the corner and then off to The Parade Gardens for a dance and sing along with The Blues Others. Great fun! 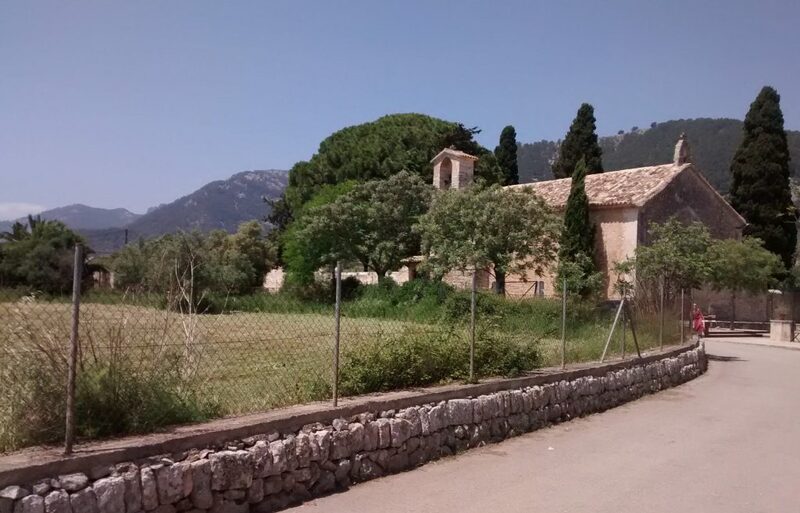 Twelve years ago Candy Verney took members of our choir on an exchange visit with a choir from the small village of Campanet in Mallorca and this was a lovely opportunity for Anne and Celia to revisit the village and meet up once again with the choir and the people they had stayed with in their previous visit. Caroline, her husband Nick, who held his own as our only bass, (thank you Nick) and sixteen choir members made the trip this time around. 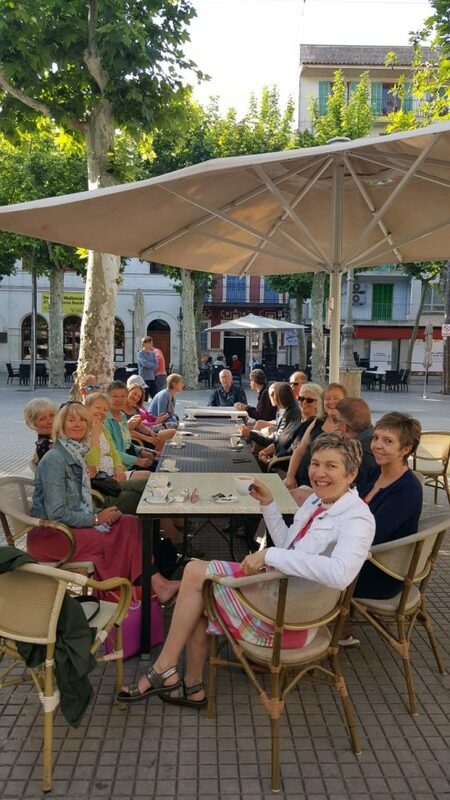 We were welcomed once again by the lovely, Campanet choir , to make the most of singing together and spending time with good friends, new and old, on a beautiful, sunny island. Singing, chatting, eating, singing, drinking, cycling, singing, swimming, walking, sight seeing and yes more singing. Here are a couple of recordings from the weekend and a few photos. 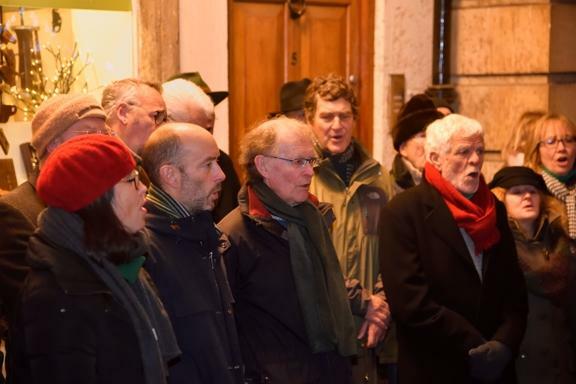 Singing on the stairs of the Town Hall with all parts standing one behind each other was new for us all and took a bit of getting used to. We had an appreciative audience from Germany and Trowbridge and the event tied in with the start of the Cloth Road Arts Trail which was also using the venue for local artists’ work.Caroline and Sarah may well have managed to secure a choir exchange for net year with, Leer in Germany. On a busy Saturday in March we braved the freezing cold to sing at this nationwide charity event on to raise awareness and funds for Youth Music. Platform 3, Bristol Temple Meads was probably one of our more challenging venues. 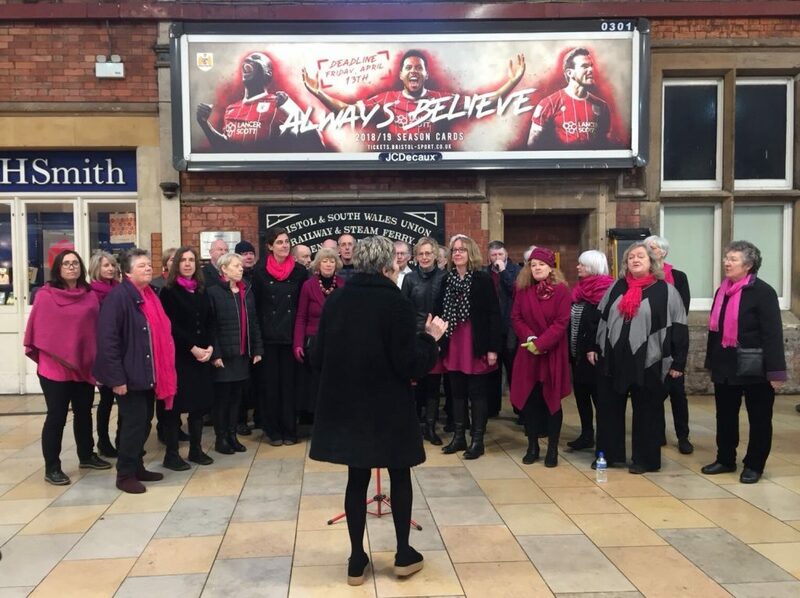 Being heard over the trains, announcements and general bustle of the station at some points was impossible but we sang as loud as we could and during the times when there was quiet people stopped to appreciate the singing by all choirs involved. Apetito offer regular free Sunday lunches to those over 65 and this year we enjoyed singing a half hour set of festive songs for those who had enjoyed the Christmas lunch, kindly provided by the company. A really enjoyable end to our singing year! Photography by Rick Buettner photography. 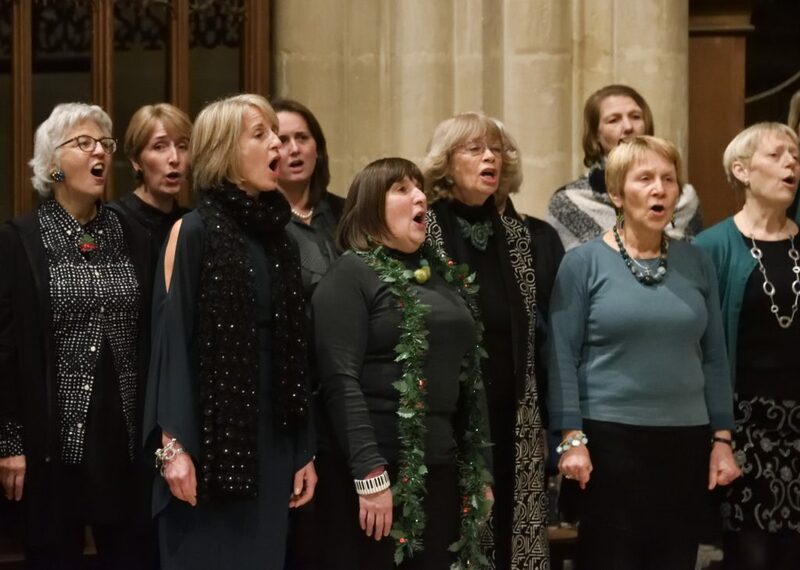 On the coldest night of the year we made our way to the magical setting of Edington Priory for our Festive Concert.. 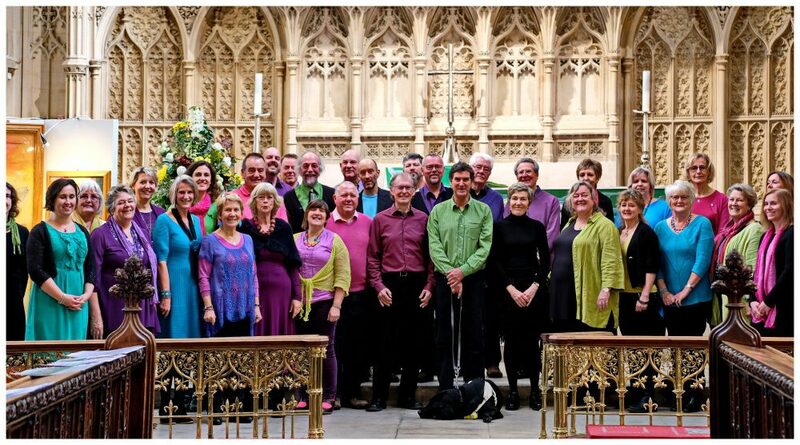 The audience included three appreciative Guide dogs, with Nimmo joining in with some of the harmonies! 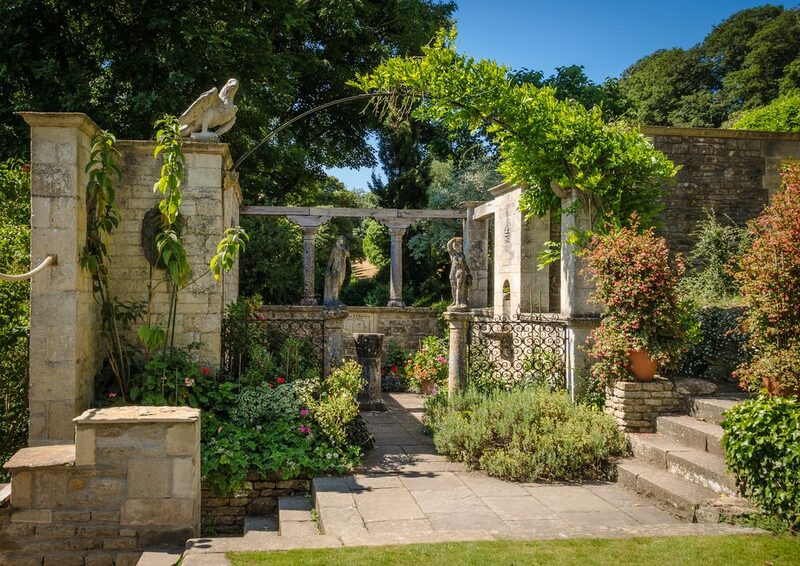 Profits from the wine, food and bucket collections went to our chosen charity, The Guide Dogs and when amalgamated with the money made at Bath and Bratton, the total raised was £311. A really cold night aga in but warmed with mulled wine, mince pies and mulled wine we enjoyed some less formal singing of our festive repertoire for villagers at a private party. This was then followed by more mince pies, sausage rolls, (kindly provided by the landlord and lady) and alcohol, as we continued with some rousing singing in The Duke Pub. 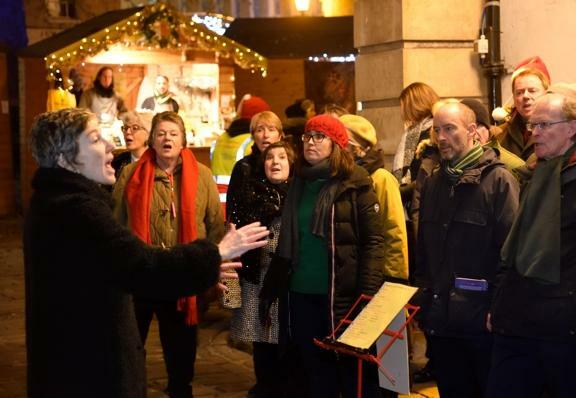 A cold snap marked thestart of Christmas singing for Sounding It Out in the Bath Christmas Market. 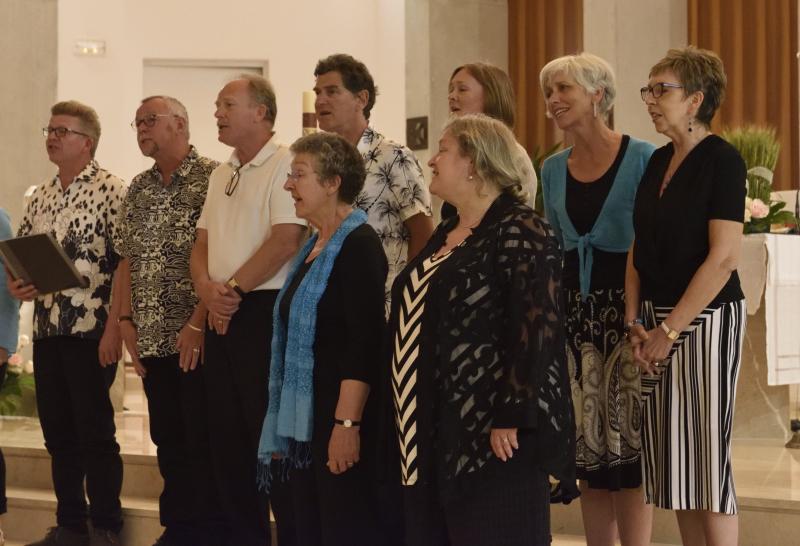 We sang to a good sized crowd of appreciative listeners many of whom joined in with the traditional favourites. We collected for our chosen charity, The Guide Dogs and raised £96.12. 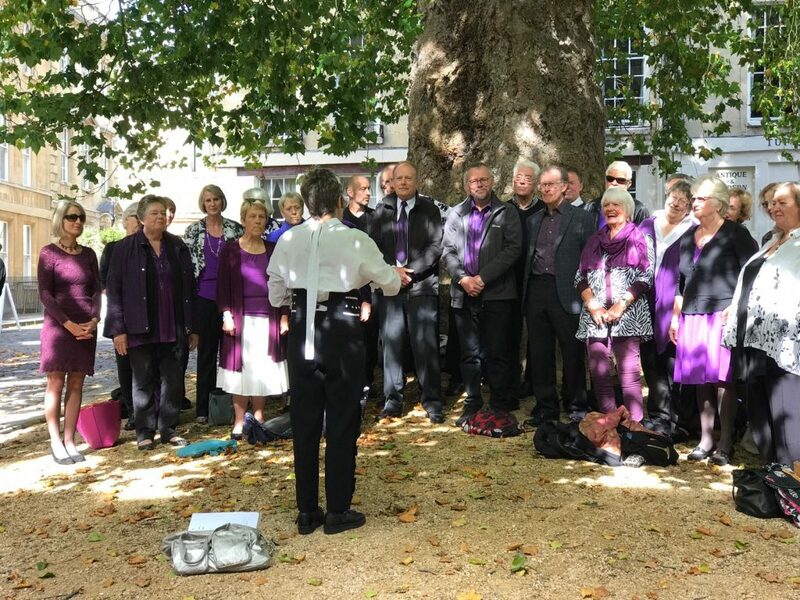 A beautiful day in Bath and Abbey Green was the perfect place to have our warm up and what turned out to be an impromptu concert as people strolling through Bath stopped to listen. It is a privilege and an amazing experience to sing in the Abbey. The acoustics are fantastic! 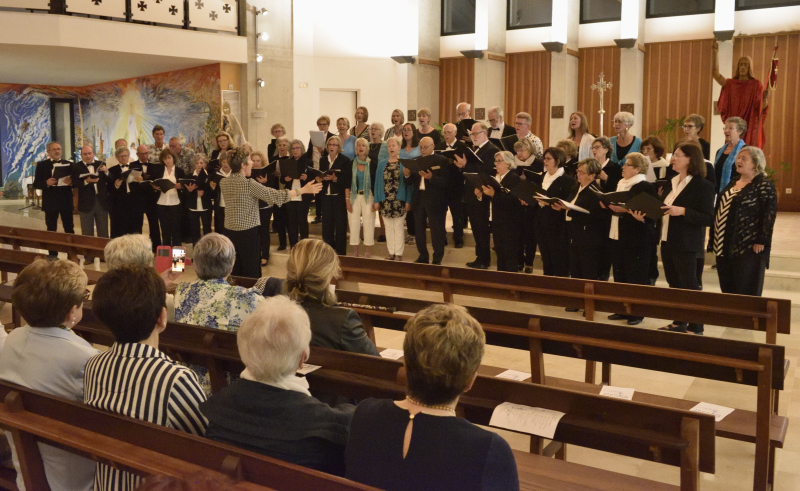 A number of people rose to the challenge of singing superb solos in this beautiful but slightly intimidating situation and the whole concert seemed to go down well with the audience. 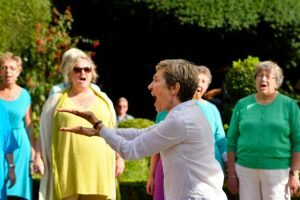 A celebration of the end of another singing year for Sounding it Out, Songbirds, Shreen Harmony and Skylarks. 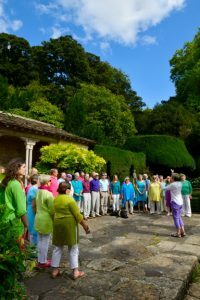 This was our opportunity for all singers, from Caroline’s four choirs, to come together to sing, share songs and to listen to each others repertoires. 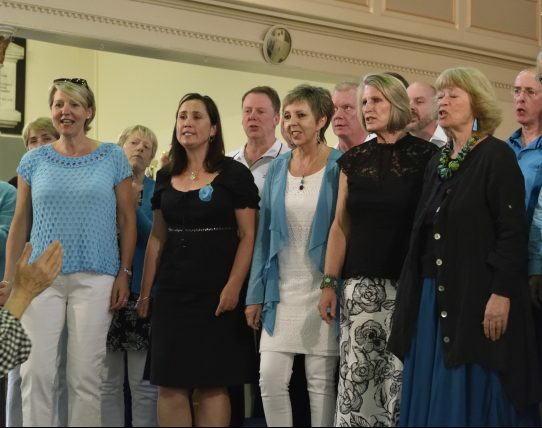 This year we performed at the Cheese and Grain in Frome, a slightly more spacious venue than last year which made for a more comfortable event for friends, family and singers. It was great night and a really uplifting end to the year! 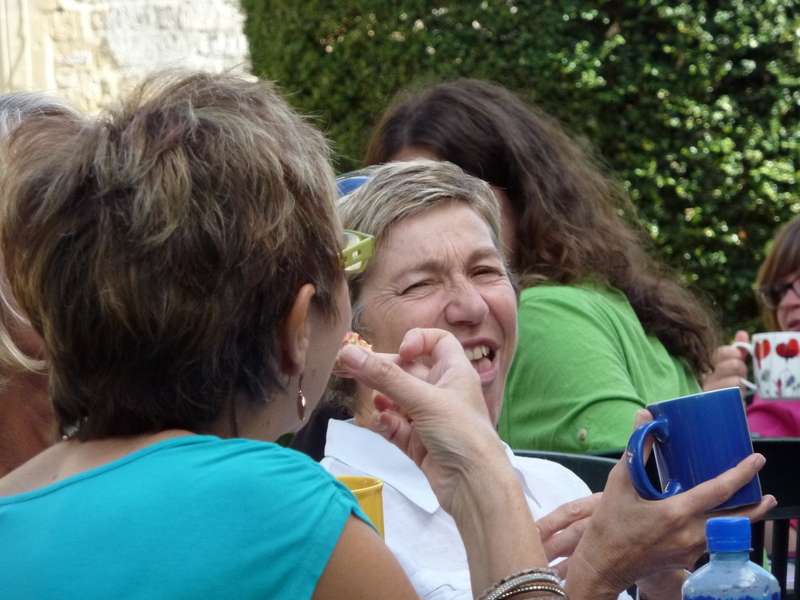 A lovely sunny day – just as Caroline had promised. 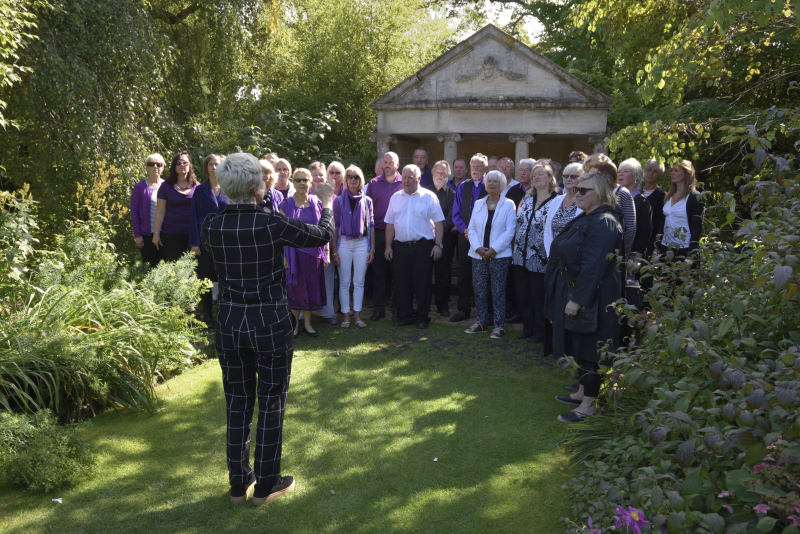 As well as ourselves there were a number of musical performances from the band stand, including Caroline singing with Terry Hill’s Big Band and Claras’, (one of our previous choir members), Bath and Trowbridge choirs. We sang a jolly,half hour set on the band stand to lots of people enjoying the activities and stalls in Trowbridge town park. busy town park. What a day for a 13 mile sponsored walk along canal towpath with no shade. 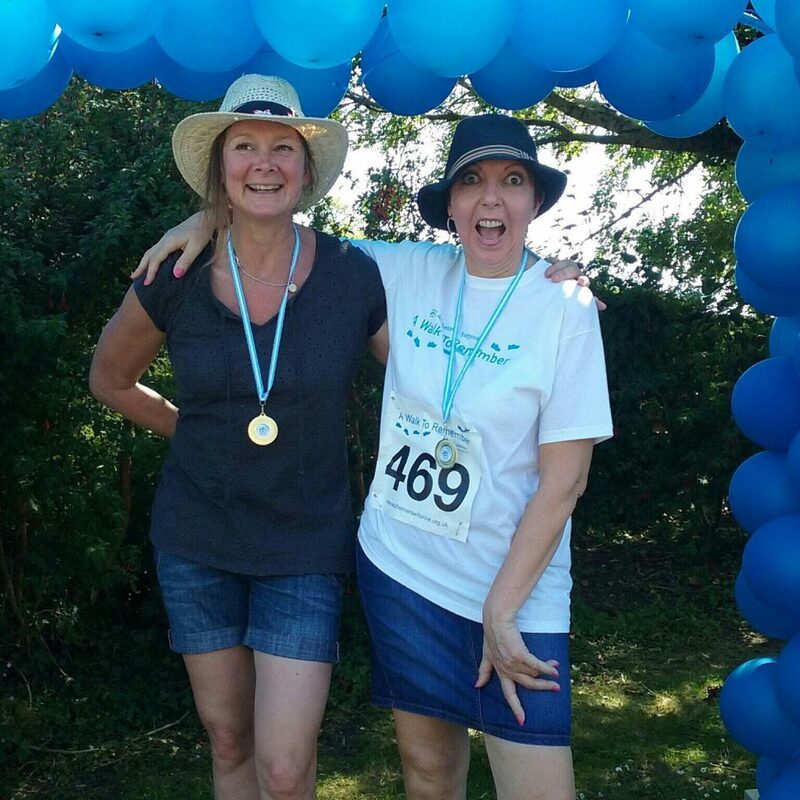 On one of the hottest days of the year about 15 members of Sounding it out and some members from Caroline’s other choir, Songbirds, together with another 300 people and many dogs, enthusiastically set off to help raise money for this Wiltshire based charity. We had a welcome break for lunch at The Barge, Seend, where the pub landlord kindly offered all walkers a much needed free soft drink! 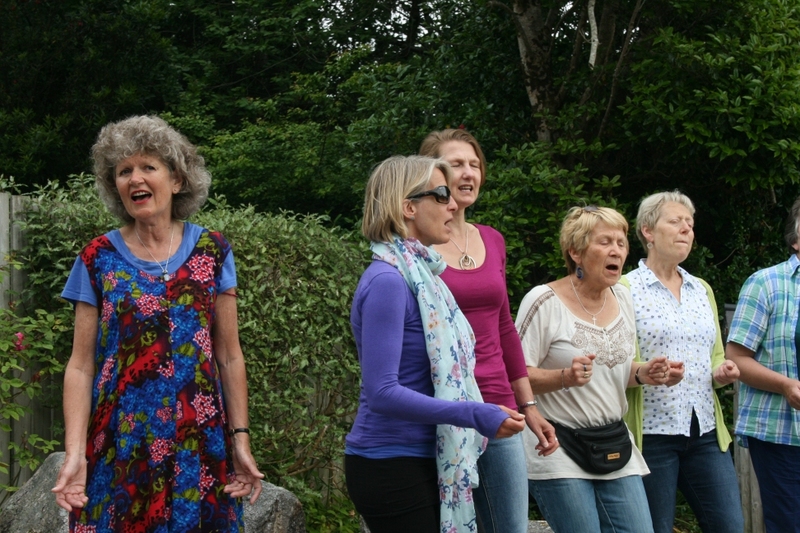 Walkers were joined by other members of both, Sounding it Out and Songbirds, to sing a few songs from our repertoires to the large gathering making the most of the sunshine in the lovely pub garden. 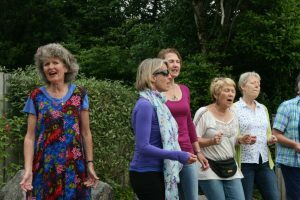 Another 5 miles and the walkers finally arrived at Devizes Wharf to be greeted by music from Dr Zebo’s Wheezy Club and a barbecue, followed by another session of singing by both choirs. 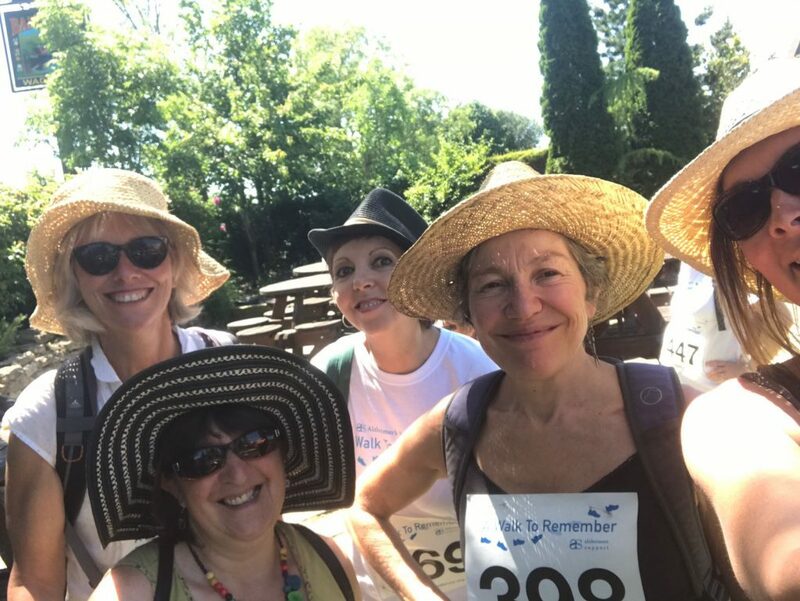 We haven’t heard yet how much has been raised overall by the walk but walkers and singers were really pleased to have been able to contribute to the day!! 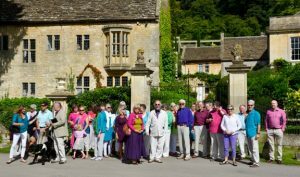 The opening night of the Bath Festival is always one of the highlights of our singing year. 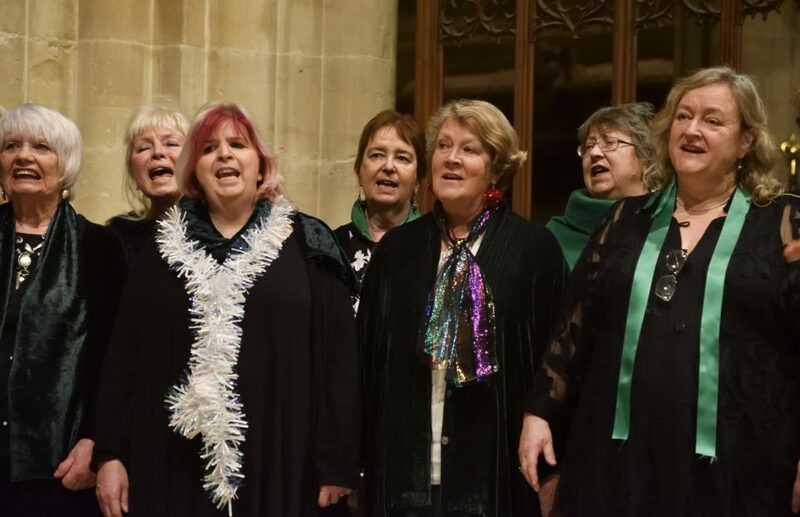 It was our chance to perform two new song, which we have been working hard on for months – Caroline’s lovely arrangements of David Bowie’s, Where are we Now and Dolly Parton’s, Jolene. 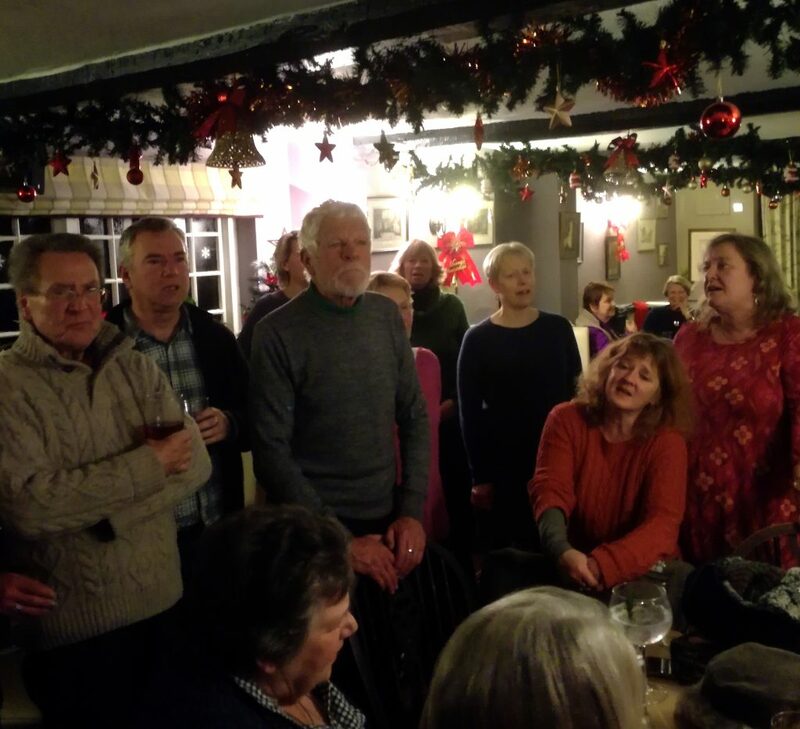 We sang our best to a good sized audience before retiring to the pub for some more slightly rowdier singing! 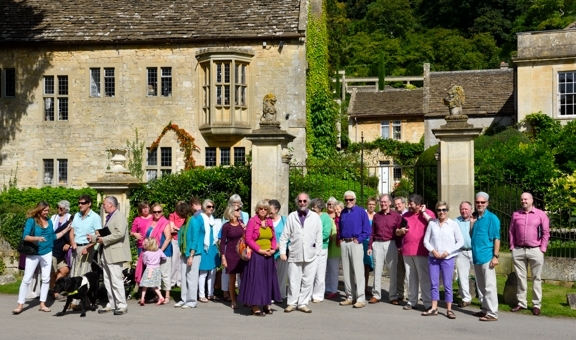 On a beautiful sunny day twenty choir members and Caroline set off for the choir convention in Bristol. We were all a little reluctant to sit inside for 8 hours on such a glorious day but in the hope of learning some interesting new songs we all sat down and gave it a go. In the end the lure of the sun proved too much for many and mooching around the Waterfront seemed far more appealing. 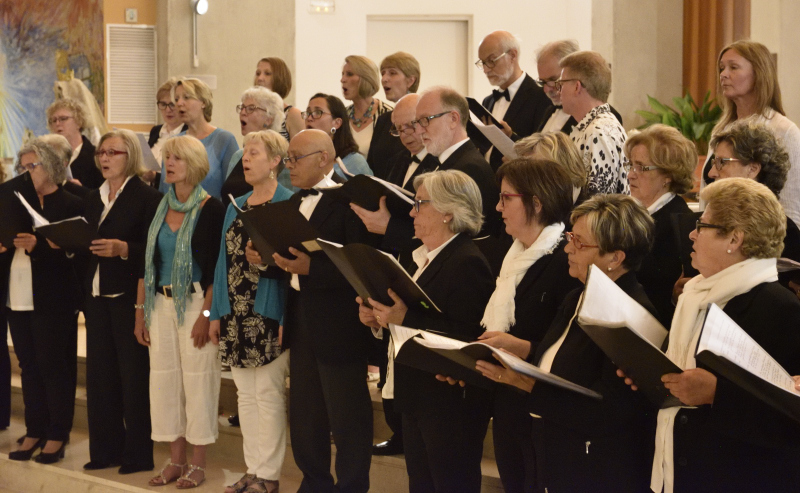 The evening concert started at 6.30 and there were numerous choirs from the South West to perform two songs each. It was a great evening and we all really enjoyed watching and listening to the different choirs and the diverse range of songs. Our own performance was pretty good and Evo Banke went down a storm! 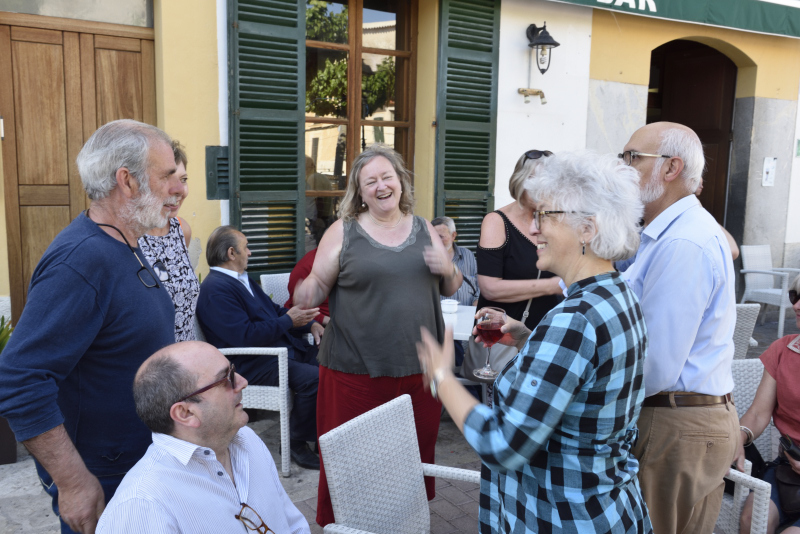 We hadn’t realised that we would be singing in the foyer as people arrived, got their pre dinner drinks and mingled, which meant that we were battling to make ourselves heard above the general chatter and the interuptions from the town crier! We took it all in our stride, rose to the challenge and gave a great welcome to the guests. 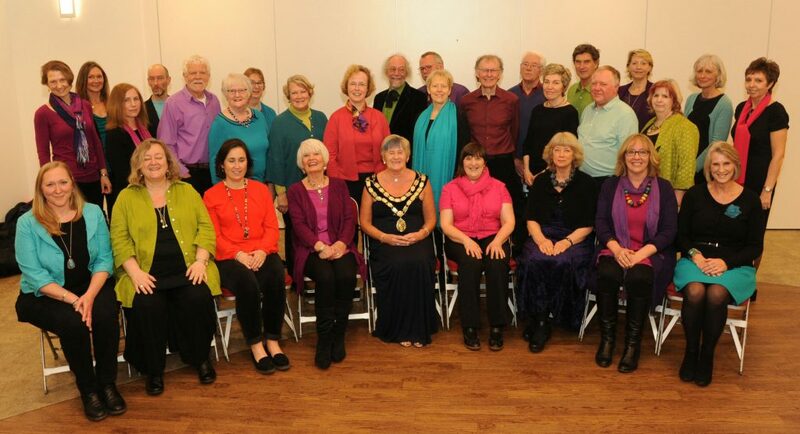 Here we are after the event with the current Mayoress of Trowbridge. 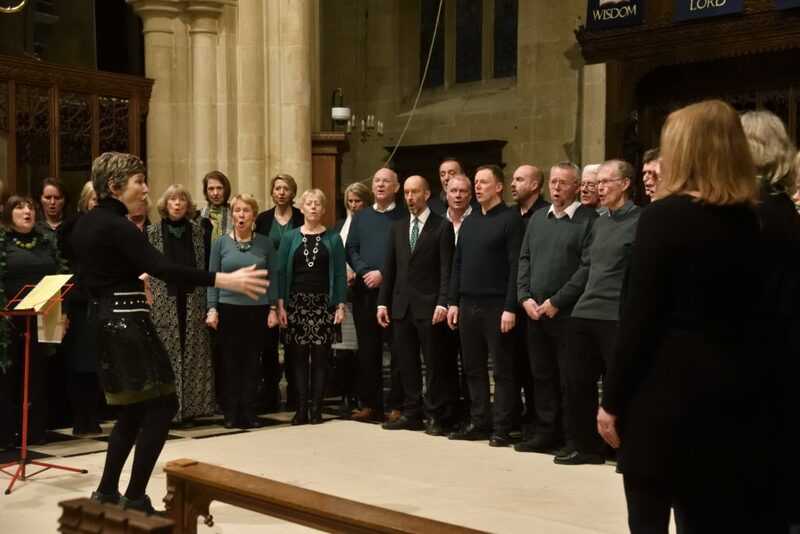 During our regular singing session on Monday 27th February the choir were put through their paces under the expert eyes and ears of, well known vocal coach, choir leader and singer, Helen Porter. What an exhausting night! We worked really hard to improve on our weak points and improve and she did wonders for our, pitching, posture and delivery. Now all we have to do is remember it all! Photograph of our rehearsal prior to going on the main stage at The Bradford Roots Festival. 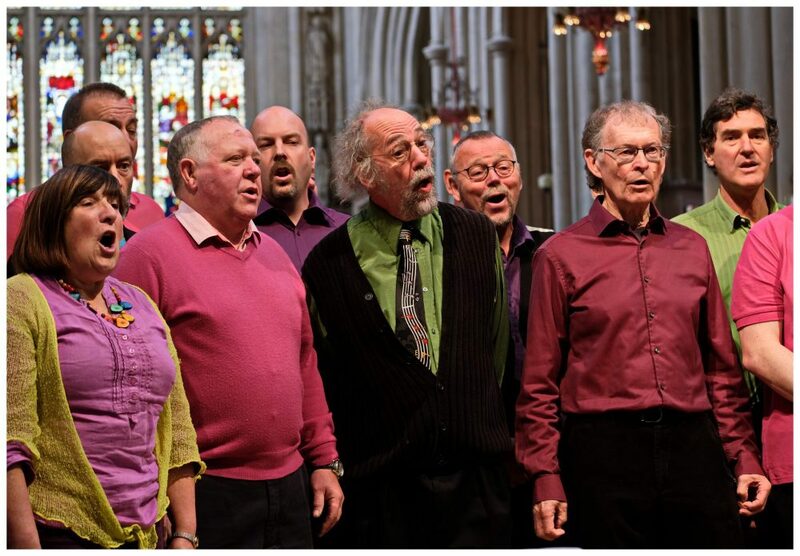 Sounding it Out had a 30 minute slot to wow the audience with our varied repertoire at this excellent weekend music festival of local talent at the Wiltshire Music Centre, Bradford on Avon. 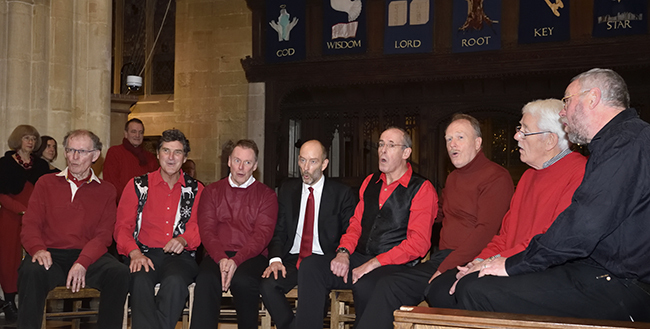 Our annual Christmas Concert was held at St John’s Church, Studley, Trowbridge. Many thanks to our fellow singer and rector of St John’s, Liz Gifford for arranging for us to use her lovely church. This was the culmination of our first year under the fantastic and inspiring leadership of Caroline Radcliffe. We were very pleased to sing to a packed church including our previous choir leader and founder, our good friend, Candy Verney. 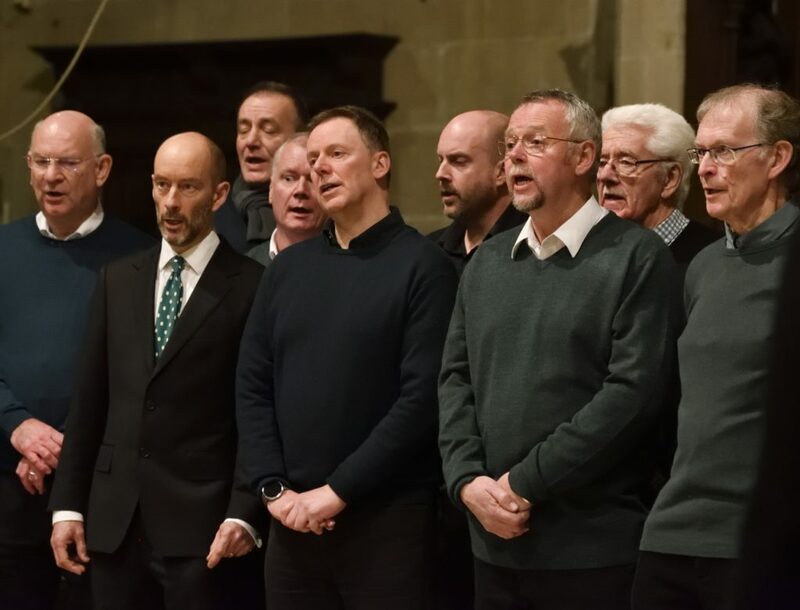 The repertoire included several beautiful and interesting solo and small group pieces as part of a varied seasonal repertoire of festive songs from around the world. Another Christmas and a great evening, singing carols and festive songs under the arch at Abbey Green, Bath. As has become a bit of a tradition this was followed by slightly more rowdy carol singing in The Raven afterwards! It is always a magical night but this year there was one particularly lovely moment when a young Polish lady stopped to join in the singing of a Polish Christmas Lullaby, Lulajze Jezuniu. During the singing we made a collection for the choir’s chosen charity for this year, Bloodwise. 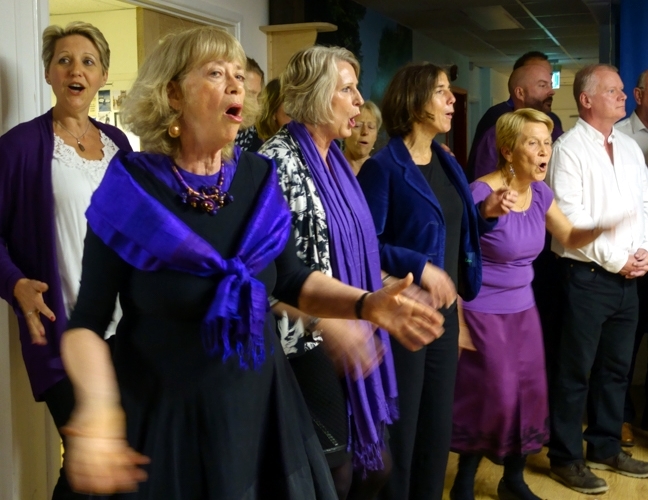 Several singers from the choir, with sore throats and coughs of varying degrees, who were available on a weekday afternoon, visited Ashwood and Henford House care homes in Warminster to sing traditional carols and festive songs to their residents. We have done this for a number of years in Bath but decided to try somewhere different this Christmas. It was a really lovely afternoon and the staff and residents seemed to enjoy our singing and joining in with the carols. We have already been asked to come back again this year… to both homes! What magnificent surroundings to sing in. Fantastic accoustics and a big audience .. no pressure! but we all enjoyed the challenge of singing in such an amazing place and in particular our soloists did us proud. Marc recorded the whole concert and you can listen to them here. 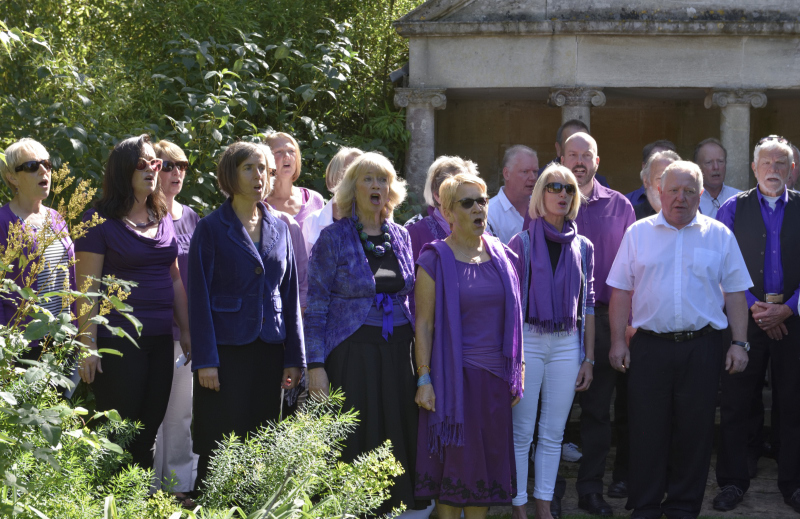 Singing in the September sun in the beautiful gardens at Iford Manor. Followed by a cream tea! At the end of our singing year all three of Caroline’s choirs came together for an evening of shared singing. 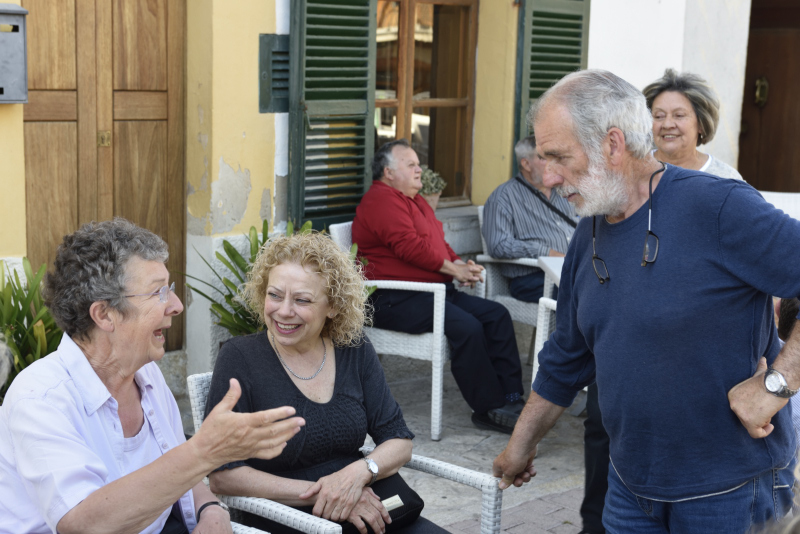 It was great to meet members from Shreen Harmony and Songbirds, and have a chance to enjoy listening to each others repertoires. See the video on our See and Hear Us page. A really uplifting finish to the year. Hopefully this will become a regular event! 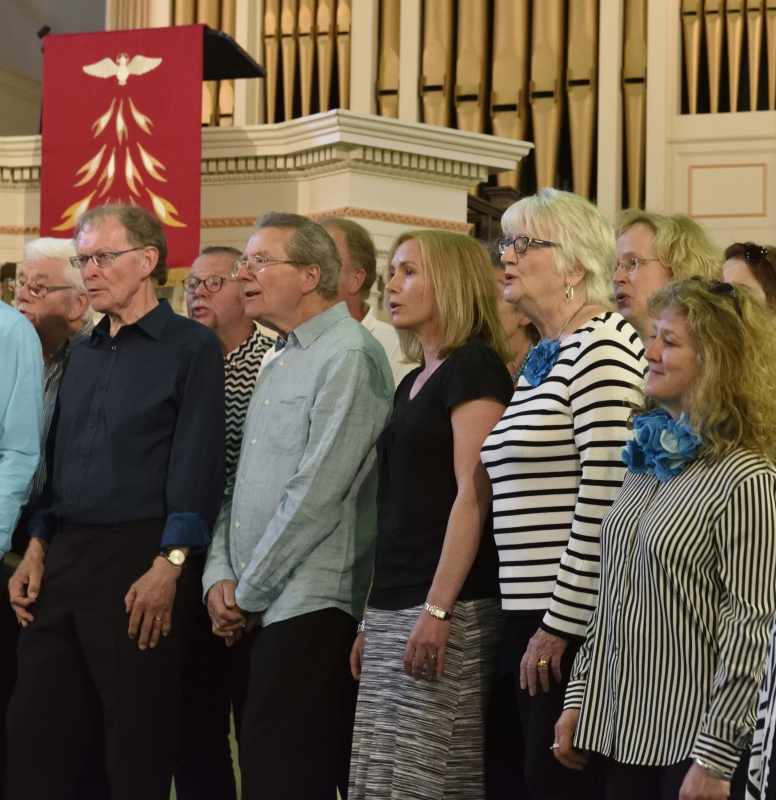 Singing in th e United Reformed Church, on the opening night of the Bath Festival.